Props to Eastern for stepping into the game with an entry level-bike featuring flatland-friendly geometry. 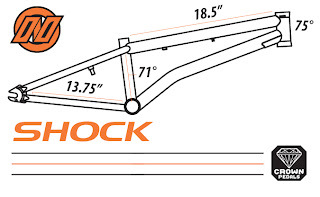 With an 18.5” top tube, 75 degree head angle, 71 degree seat tube angle, and 13.75” chain stay length, the Shock’s geometry is comparable to that of many pro-level frames which cost more than this entire bike. 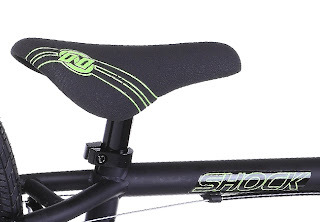 Other features that give the Shock flatland appeal are its included front and rear brakes, plus gyro detangler. 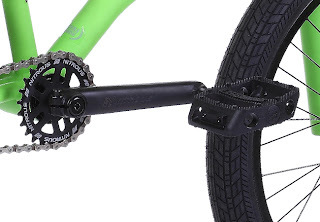 Add the set of included 175mm heat-treated chromoly cranks, and you’ve got a pretty decent setup here, especially for the price (only about $290). But all in all, this bike seems most appropriate for a smaller rider with street intentions, rather than for an average-size adult flatlander. We suspect that this may have been Eastern’s intention all along, despite the fact that their website refers to the frame as being flatland-specific (instead of just being small). In closing, an adult-size flatlander on a budget would probably be better off saving up an additional $50 and buying something like a DK Opsis, which comes with a chromoly frame and fork, two sets of pegs, and a freecoaster. 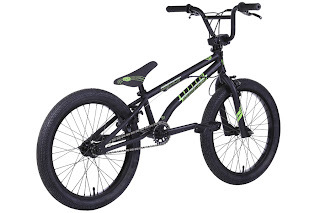 But if you know a kid who’s dying for an entry-level BMX bike, the Eastern Shock would be pretty damn sweet. Hopefully this is a sign of more flat things to come from Eastern, a company with a long, well-deserved history of respect in BMX circles. Get the 2012 Shock for a great price by clicking here.